Sandy Walker and Andy Broad got together in early 2010 to work on a couple of songs that Sandy wanted to perform at the regular jam that Andy was hosting. The jam went so well that they decided to get together again. This time Sandy brought along some lyrics she had been working on and Andy immediately found a chord progression that fitted. Sandy is a prolific lyricist with a good ear for melody and harmony and Andy has a wealth of chordal and rhythmic ideas. Sandy soon threw her piano playing skills into the pot to add yet more spice to the mix. 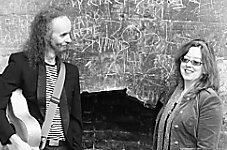 Sandy’s roots are more folky with an interest in jazz whilst Andy is an established Blues performer with a side line in Jazz. The resulting original music is a unique blend of all three, with lively Latin inspired foot tappers and jazz tinged ballads and a couple of out an out bluesers, every song with its own story. After a year of working together they have upwards of 15 strong originals and the Walker Broad duo are working on their first album, working title “A Walk Abroad”. Their live set includes a selection of their own songs plus a few blues and jazz standards, and one or two traditional folk numbers. If you’d like them to perform at your venue or private occasional (how about a house party with a difference?) give Andy a call on 02392 877 933, or listen to our music on ReverbNation. Can’t the ticking of the clock be stilled this time? So let’s throw the towel in, start a brand new life? Will the pastures be a bit more green today? Misery for me, is this the way it has to be? How to find the courage to carry on? Will I ever tell a brand new story? Can’t the taxman leave a bit behind for me? Home at end of day, are we going out to play? C’mon tell your brand new story.